Where Have All the Apples Gone and Can These Farmers Bring Them Back? The Temperate Orchard Society, a tiny nonprofit in Oregon, is working to save the most diverse collection of apples in the nation. 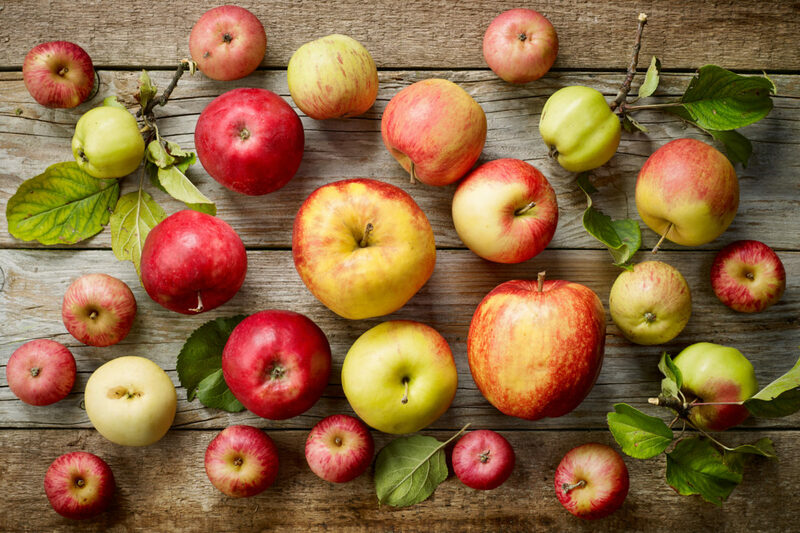 Lovingly called “our national fruit” by Ralph Waldo Emerson, apples once proliferated in American backyards and orchards, a vital source of nutrition and a potent symbol of home. But now, most of the 15,000 named varieties grown here since 1804 are extinct, and only 15 kinds of apples (think Red Delicious and Gala) now account for 90 percent of U.S. production. The U.S. Department of Agriculture (USDA) preserves 2,000 international varieties—some of what remains of the diversity of Malus pumila—in Geneva, New York. But, in northwest Oregon, a 4,500-variety private collection of fruit suited to moderate climates surpasses the government effort. The collection was originally amassed by a man named Nick Botner. For 30 years, Botner grew an ever-larger selection of heirloom varietals in what eventually became, as he aged and ailed, an over-grown, under-tended orchard. In 2011, he put his property on the market. The TOC team knew Botner from their mutual affiliation with another apple-related organization. They recognized the adverse repercussions on orchard fruit diversity if his collection was sold and plowed under. Together, and with Botner’s blessing, they started in on what Cooper—a lifelong gardener and apple-identification buff—laughingly calls the “kind of foolish,” monumental task of replicating Botner’s trees. Apples can be grown from seeds, but since each seed yields a tree distinct from its mother, consistency is only assured by grafting a slim branch of the old tree, called a scion, onto a rootstock (a stump with a healthy root system) taken from another apple tree. Walking Botner’s six-acre orchard back in 2011, Cooper and company began to whittle off scions. They managed to collect about 800 varieties in each the first and second years. These they grafted onto rootstock in a warm, spacious, horticulture-department workroom at Clackamas Community College and placed in one-gallon pots. Heading into winter, 5,000 trees representing some 3,900 of Botner’s varietals have been cloned. However, says Cooper, “Whenever you’re grafting, you also have losses, so one of our jobs this December is to do an inventory and make a list of what we still need to complete.” If all goes well, she thinks that next spring, TOC will be able to graft the last few hundred trees in the Botner collection. After completing the cloning, the TOC’s three members and their devoted handful of volunteers will start moving trees—some of which are currently planted in nursery beds, others of which are stored in pots under shade cloth—into the first two fields of the orchard. So far, Cooper estimates that she, Shepherd, and Baccellieri have definitively identified about 800 of Botner’s varieties by considering various visual and structural characteristics. They know they’ve got King of Tompkins County, a juicy apple with red cheeks and stripes that hails from New York. And they also have Blue Pearmain, a New England variety from the 1800s that’s covered in a blue haze and offers a crisp bite. Others defy easy classification. That’s because, for many varieties, “We just have a name, and that means nothing to us,” says Cooper. “When we are doing ID work, we are usually sitting at a table, surrounded by piles of reference books where we search for descriptions and pictures.” Additionally, TOC has also sent leaves from 69 apples to the USDA’s lab in Colorado for genetic testing. It’s a science in its infancy, with a prohibitively high price tag, which in this instance the USDA performed gratis because it wanted to find varieties it didn’t have in its own collection. And when additional scions from TOC’s trees start becoming available for purchase in 2017, helping to re-establish varieties that haven’t existed outside Botner’s small acreage possibly for generations, apple-lovers far and wide will also get to reap the rewards. Photos within the story by Jafar Jefferson and Franki Baccellieri, respectively.